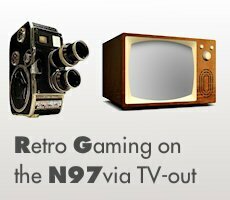 Last week, I decided to give my Nokia N97’s TV-out feature a try and see what it would look like when I played some retro games on the television. I was pretty geeked out when I realized how well it worked: the games looked great, and it really enhanced the gameplay. It was almost the same experience as playing the actual video game consoles. When you’re on the road with a Nokia N97, it’s like having a versatile, retro gaming device with you that fits in your pocket, that you simply can plug into any television: sort of like a game controller with all the games built-in. I tried out Quake and Quake 2, Alien Hominid with the Game Boy Advance emulator vBag and Super Mario Brothers Deluxe with vBoy (it was really slow for some reason). I topped the gaming session off with Sonic the Hedgehog and some good, old fashioned street fighting in the Sega Genesis game Streets of Rage 2. Finally I played a couple of classic Lucas Arts PC DOS adventure games from the mid-90s: Sam & Max and Full Throttle (with the help of ScummVM). Watch the video below to see what it looked like. Please,can you tell me where to download Quake1 game files(full or just demo whatever)Quake2 works great,but I cannot find game files for Quake1:(. This site is so damn good!